Because we care! At Griffith Exteriors our number one goal is to have total customer satisfaction. We are a family driven business and we understand that every customer deserves our time and attention to every detail. 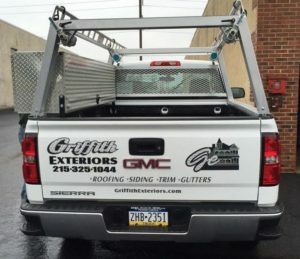 From the moment you call Griffith Exteriors you will feel as if you are part of the family and we will accommodate any and every concern you may have regarding your home’s exterior. Whether we are repairing a shingle or replacing your entire roof we want to give you an unparalleled customer service experience. In our business or any other business for that matter you are only as good as your word and the words of your customers. We pride ourselves in our referrals! Customer service is one thing but what about material? At Griffith Exteriors we only deal with reputable manufacturers of the highest quality exterior products. It is important for us to take a step back and ask ourselves if this were our home what kind of material would we like? Would we prefer an inferior product that doesn’t save more than a few dollars or would we rather have a complete system that is designed to work together? Unfortunately due to the rising fuel costs more and more contractors are having a difficult time answering this question. We believe that that the moment we sacrifice the quality of our product to cut costs we are taking a big step in the wrong direction. We will never use inferior products on any our projects. The materials that we use are clearly specified on all of our documentation and you can rest assured that if you have your job installed by Griffith Exteriors you have a system that will last for years to come. Years after our competitor’s products have failed and their “warranty” has expired.